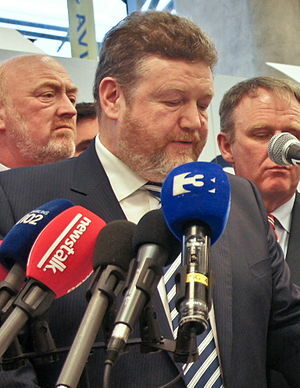 HEALTH Minister James Reilly was not at his department desk — nor at the HSE press conference — as €130m of health cuts were announced.He ignored the clamor for a response to the savage budget slashing that will particularly affect the elderly and disabled.He did not appear on any radio or television programmes and was not available for interview – despite requests from every media organisation in the country.Along with all the other refusals he declined to appear on RTE’s flagship Morning Ireland programme today, missing a prime opportunity to reassure worried and angry patients. Missing Minister: €130m cuts but no answers from Reilly via @independent_ie. I was just listening to radio one “The Ronan Collins Show” This lady Oral was complaining about the latest cuts, at first I was sympathetic towards but as the interview went on I started to change my opinion towards her .She was asked if she voted in the present government and she said yes, then it transpires she was a civil servant (a teacher if you don’t mind) Now I was totally gone off her and her whinging!.Don’t get me wrong I expected these cuts to manifest themselves as soon as the present government got into office ,that is why I presented myself as an independent in the last general election in a vain attempt the secure all of our hard won Health services and to bring about an end to the Quango’s and vastly over paid TD’s and all government and semi state management .Ranging from the ludicrous salaries of the top presenters in RTE ,the management of the HSE and to tackle and drastically slash the pensions of past minsters, and Bank directors for starters. But no, people like ORL decided to vote in the same old gangsters and liars once again! This is the problem with the people of Ireland when they had a chance to bring about real change , and vote in new committed people , the likes of this woman voted in the same gombeens, liars, and self-serving politicians that have graced the Lenster house since I was a boy and that is a long time ago. This Oral, now wakes up to the health cuts, why because it is now affecting her at last! As a teacher she is getting well paid (a year’s pay for 9 months work not to mention the sick days .The people of Ireland must wake up and realize that the old established political parties and all just the same, there are no differences between the lot of them. They are all part of a corrupt political system that has served the real people with power in Ireland and that is the hidden, faceless moneymen who infest all of the established political parties. The working men and woman have been stitched up, bamboozled, and ripped off with empty promises and until people like ORLA wake up and vote in non-aligned, independent candidates, new people from the ground up ,there will be no change. I think I can now show that Labour, Fine Gael, and FF are all the same. Sorry Oral you are just as responsible for these cuts and the Gombeen politician James Reilly and the rest of the economic traitors milking the people of Ireland for all they can get ! IF you want to know where the classic 1980s power ballads (the theme from ‘Dirty Dancing’, Laura Branigan’s ‘Self Control’, Heaven 17 numbers and assorted gems from the New Romantic era) ended up, look no further than German radio. While I was driving through the northern bit of the Rhine yesterday, the car radio offered up an eclectic mix, ranging from the reasonably nostalgic to the God-awful, in a display of Catholic music tastes befitting a journey that concluded just outside Cologne cathedral, Europe’s biggest. The other noticeable thing about driving in Germany on a weekday is the sheer amount of commerce on the roads. The inside lane of the autobahn is an uninterrupted convoy of trucks shipping Germany’s exports all over the continent. I moved over to the Town of Lubeck in Northern Germany last November and I have been coming back to Ireland about every 8 weeks. The cost of accommodation is the first thing that hits you a one bedroom apartment in my town set’s me back 300 Euros in the best part of town for the month .My grocery bill is about one third of the cost in Ireland . Most striking of all is the people I have to deal with in the local council are in fact highly professional and highly qualified to be in their position and are totally answerable for their actions. You get immediate answers and immediate costing that stays the same when you are paying your bill. There is no messing around going from Billy to Jack to Jill and then her aunty down the hall and then once all around the building again just for good measure in case you misses somebody . They have a vested interest in getting you started in your business a can do altitude is everywhere within the German local civil service. Having said that I can confirm I have noticed a few small shops going out of business and there does seem to be a growing number of shops going out of business just off the main pedestrian streets . German’s are not going out to local cafe during the week much as they used to according to a friend of mine who has a cafe in town! Downside is there is no minimum wage and you could end up working for around 3 euro (so you might end up working two to three jobs) per hour you not likely to build up any service years as most people have to move around from job to job there are no lifelong jobs but that can also be a positive.